We are continuing today our series of articles on BMW’s past concepts and prototypes, some interesting vehicles that set course for many models to come. 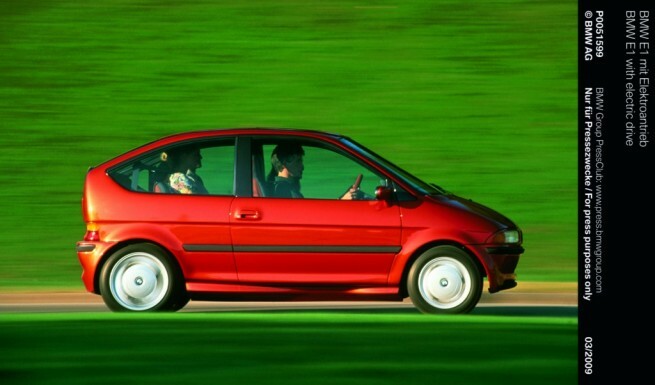 Next in line, it’s the BMW E1, an electric vehicle that made its debut in 1991. Nearly nineteen years later, BMW is heavily investing in electric mobility and most of the recent Research and Development efforts focus on the upcoming Project i program. As a prototype with the model designation BMW E1, the four-seater incorporated a design with pioneering aerodynamic and ergonomic features that provided impressive testimony to the superlative potential of its emission-free drive technology even in normal everyday use. The prototype generated universal acclaim among members of the public and independent testers. The readers’ choice in car magazine “Auto Zeitung” voted the BMW E1 as the winner in the category “Environment and Technology”, and trade magazine “Auto Bild” described the BMW E1 as “the most advanced car of the century”. The fact that the prototype designated internally as the BMW Z11 was ultimately launched in the public domain as the BMW E1 bore testimony to its revolutionary power unit: The BMW E1 presented at the Frankfurt Motor Show in 1991 had an electric motor mounted in the rear. The development goal of this project was to carry out research into the advantages and disadvantages of a car propelled entirely by electric motive power when subject to the practical test of everyday conditions on the road. The BMW E1 was also intended to represent a standalone, efficient automobile that was designed according to all the defining principles of driving pleasure while making no compromises with respect to functionality. Today, the BMW E1 is regarded as the launch pad for holistic development of electro-mobility concepts in the BMW Group. A number of electric vehicles had already been developed on the basis of conventional series models from the start of the 1970s onwards. These vehicles had yielded fundamental insights into the areas of power-unit and energy-storage technology. The BMW E1 was the result of the first vehicle concept based on electro-mobility. The electric motor of the BMW E1 packs 37 kW with power being transferred to the rear axle. The innovative extruded aluminum construction and plastic body produced an exceptionally lightweight city car with a top speed of 120 km/h and a range of 200 kilometers. 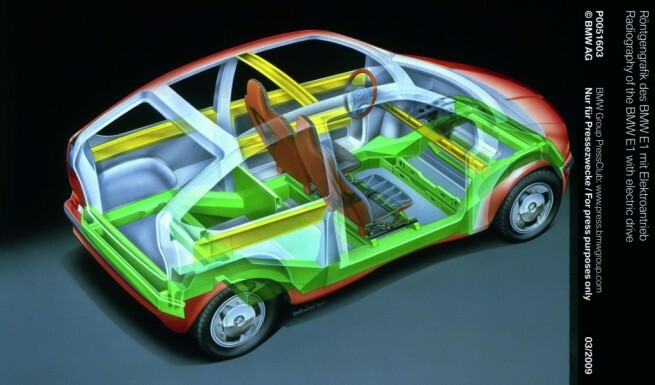 In the BMW E1, sodium-sulphur batteries are mounted under the rear seat and adequately protected in the event of a crash. A conventional domestic power socket is all that’s necessary to recharge the power supply. The BMW Z15 designed as a successor and the slightly bigger BMW E2 based on that platform are powered by a sodium nickel-chloride battery. 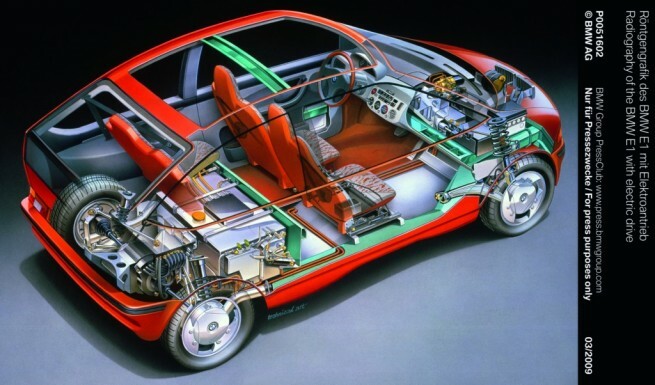 The basic conclusion from this development series established in the early 1990s was that vehicles powered with electric drive are technically feasible, but the technology for storing electric energy needs more work and sets practical limits for use. Nevertheless, BMW had already laid the foundation stone for projects currently developing emission-free mobility in urban environments. This has provided a technological lead which the BMW Group is demonstrating today with vehicles like the MINI E and the BMW Concept ActiveE. Next post The concept for the BMW Mega City Vehicle is the iSetta? Video: Are These 15 Things You Didn’t Know about BMW?